This brief is based on an interview conducted with Lucas Chancel at the Paris School of Economics on 11 January 2018, and is supplemented by figures. Recently, the report on global inequality, produced by Thomas Piketty and Lucas Chancel’s research teams from the Paris School of Economics, showed that since 1980, the richest 1% of the global population has captured 27% of the world’s income growth. Conversely, the poorest 50% only received 12% of this growth. While this income growth, which is related to globalization, has enabled the poorest segments of the populations of emerging countries to escape from poverty, the middle and working classes in developed countries have benefited only marginally. This observation disproves the “trickle-down theory”, according to which the incomes of the richest individuals are re-injected into the economy through their consumption or savings, thus contributing to economic activity and employment. 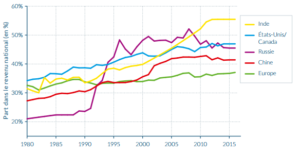 The report on global inequalities also shows that inequalities grow at different rates in different regions. For example, income inequality, for which the main indicator is the share of national income held by the richest 10%, is increasing much more sharply in the United States, India, and Russia, than in Europe. Thus, between 1980 and 2016, the share of national income going only to the richest 10% increased from 31% to 55% in India, from 34% to 47% in the United States, and from 32% to 37% in Europe. France experienced a change in income inequality similar to that of Europe: the richest 10%, who held 31% of national income in 1980, now hold 35%. Inequalities in European countries are therefore progressing more gradually than in other regions of the world. 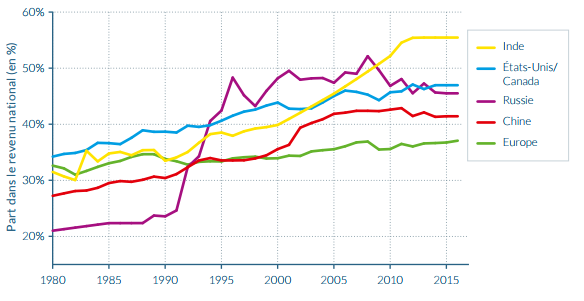 Figure 1: Development of the income share of the world’s wealthiest 10% (1980-2016). While income inequality has not exploded in France, the increase in national income has particularly benefited the richest 10%. Based on calculations using Credit Suisse data, the Oxfam report published in January confirms this trend: in 2017, the richest 10% held more than half of the wealth while the poorest 50% share barely 5% of the national wealth. Although there has been no impoverishment, middle and working class incomes have stagnated, while those of the richest have increased. Recent empirical data published by Lucas Chancel in his book Insoutenables Inégalités (Published by Les petits matins in 2017) show that victims of social injustice are also victims of environmental injustices. These injustices are of several types: inequality of access to environmental resources, inequality of exposure to environmental risks, and inequality in terms of resilience to environmental damage. 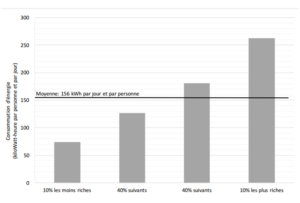 According to the author: “The poorest have less access to environmental resources such as water, energy and good quality food.” In France, for example, the poorest 10% consume 73 kWh per person per day, compared to 262 kWh for the richest 10%. The working classes are also more exposed to environmental risks than the richest households. Take pollution for example: while the poorest households contribute the least to pollution, it is these populations that are most exposed. They are therefore at higher risk of developing chronic (and potentially fatal) respiratory diseases: indeed, these populations spend more time on transport than average, they often have poorly ventilated homes, and live near major roads in urban areas. Another notable fact is that “deprived urban areas are disproportionately present around industrial and petrochemical sites,” writes Chancel. Finally, the poorest populations are less resilient to environmental shocks: they suffer the full onslaught of natural disasters, floods, droughts and storms, which can force these populations into extreme poverty, or maintain them in this plight. In this way, environmental inequalities lead to the deepening of social inequalities. Why is it necessary to fight against inequalities? Addressing inequalities is a moral obligation. However, beyond the ethical question, fighting inequality is also beneficial for the economy, social cohesion, population health, and for democracy. In his book, Lucas Chancel notes that an extreme level of inequality inhibits the functioning of the economy, since the productive potential of people living in poverty is underutilized. The author also cites work in behavioural economics, according to which an overly high level of inequality disincentivizes effort and reduces worker productivity (Cohn et al., 2011, Card et al., 2012). However, fighting inequalities for the sake of growth is not a good enough argument, because the aim of public authorities is not so much to boost GDP, as to ensure the well-being of its citizens. This well-being requires social cohesion, which can be reinforced by reducing inequalities. The increase of economic and social inequalities is not disconnected from the rise of nationalism in India, the United States, and the United Kingdom. To illustrate his point, the author of Insoutenables Inégalités refers to the stagnation of the minimum wage in the United States, which contributed to the aggravation of socio-identity divisions and fostered national populism. “The mapped inequalities are not disconnected from political tragedies and the transformation of the political programmes observed in many parts of the world. Environmental inequalities are also aggravating the phenomenon in India, Turkey, and Brazil…” noted Lucas Chancel. In addition, the well-being of a population requires good physical and mental health. The author goes on to argue that there is a negative correlation between the level of inequality and good health: the most unequal societies are thus societies where the highest prevalence of non-communicable diseases such as obesity, diabetes, cardiovascular diseases, and chronic respiratory diseases. In addition, sociology researchers have shown that an unequal society induces stress related to social status: populations at the bottom of the social scale suffer from stress because their living conditions are difficult to tolerate, while populations at the top of the social scale also suffer because they fear losing the advantages related to their social status (Wilkinson and Pickett, 2013). Finally, fighting against inequalities is necessary for the proper functioning of our democracy. The more unequal a society is, the more it becomes polarized and radicalized, and the more difficult it is for our representative institutions to reach a consensus on trans-partisan topics such as environmental protection. What public policies could reduce social and environmental inequalities? Solving environmental problems, depending on the selected policy solutions, can increase social inequalities. For example, a carbon tax without financial compensation for households experiencing energy insecurity would plunge these households into poverty. Conversely, some policies aimed at reducing socio-economic inequalities can lead to increased environmental degradation. For example, some welfare benefits may encourage individuals to adopt consumption patterns that are more damaging for the environment, especially if they are part of a catch-up logic, following certain consumption behaviours of the elite. “Environmental issues can be solved in a very capitalistic way. And social issues can be solved in a very un-environmentally friendly way!” said Lucas Chancel during our interview. It is therefore necessary to think of public policies to fight against inequalities in an open-ended way: ministries in charge of economic, social, and environmental affairs must coordinate their actions. The first approach is to strengthen the welfare state so that it takes environmental risks into account, moving beyond the risks traditionally covered by social security. “When the social protection system was devised and developed in France in the 19th and 20th centuries, environmental risks were not taken into account,” noted Lucas Chancel. However, experiences in other countries shows that this integration is beneficial for raising awareness and encouraging modest households to adopt more sustainable lifestyles. For example, Sweden has a social protection system where social counsellors are trained in ecological transition issues and they raise awareness among households about behavioural changes that would allow them to raise additional financial resources. The second approach concerns taxation. To reduce inequalities, whether social or environmental, it is essential to improve tax progressivity. Economic research has theoretically and empirically demonstrated that “tax progressivity is an effective tool to combat social and environmental inequalities,” underlines the World Inequality Report. The establishment of a progressive environmental tax system appears to be a relevant tool to reinforce the coherence of social and environmental policies: a carbon tax with a progressive rate that depends on income, with a proportion of the revenue being redistributed to the poorest households, could help break the vicious circle of social and environmental inequalities. A second taxation lever would be the elimination of fossil fuel subsidies, with the resulting financial surplus being reallocated to social protection. Looking at the example of Indonesia, Lucas Chancel explained that in 2015 the State undertook a reform aimed at eliminating fossil fuel subsidies (particularly kerosene), which accounted for 30% to 40% of the national budget, and to reallocate the revenues generated to the creation of a social security system. Finally, the third approach involves increasing public investment in priority sectors to give younger generations more opportunities. In this regard, the World Inequality Report emphasizes that “public investments are needed in education, health, and environmental protection both to tackle existing inequality and to prevent further increases. This is particularly difficult, however, given that governments in rich countries have become poor and largely indebted”. In our interview, Lucas Chancel told us that in developed countries, private wealth increases at the expense of public wealth, yet it is the latter that enables the necessary investment to sustainably reduce inequality. Several solutions exist to reverse this trend: for example, some States in the past have benefited from relief or cancellation of their debt to raise funds to make these essential investments. Is France en route to reducing inequalities? In France, the growth and concentration of wealth is likely to increase following the most recent tax reform of Edouard Philippe’s government. According to a study by the French Economic Observatory (OFCE) published on 15 January 2018, the wealthiest 5% are the big winners of the fiscal and social measures in the 2018 Finance Law. The poorest 5% suffer from the fall in housing benefits and the rise in indirect taxation (energy, tobacco), which would only be partially offset by the revaluation of social benefits. The study points out that overall, the poorest households are expected to see their standard of living fall by 0.6%. This drop would represent a loss of 60 euros per year per household. As for the middle and upper classes, they are likely to experience a decline in their standard of living from 0.4% to 0.8%. Finally, the richest 5% will see their standard of living increase by 1.6%, or 1,730 euros per household. Of these, the 280,000 richest households in France (top 1%) will benefit the most from the social and fiscal measures of the 2018 budget: their standard of living will increase by 4.8%, due to the elimination of the ISF (French solidarity tax on wealth) and the one-off fixed-rate tax of 30% on capital, also called flat tax. 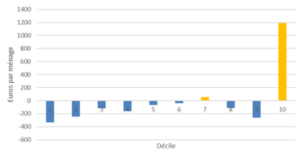 Figure 3: Impact of the fiscal measures in the 2018 budget, per income decile. During our interview, Lucas Chancel explained that the flat tax would also generate massive tax optimization behaviours, since business leaders will be able to pay less tax by choosing to pay more in dividends rather than through wages. Ultimately, if we take into account these behaviours, the implementation of this tax should cost around 10 times more to the state than was estimated in the Finance Law (1.5 billion euros), based on feedback from other countries such as the United States (Zucman, 2017). The good news regarding the 2018 Finance Law concerns ecological taxation. The budget for this year provides for an increase in the carbon tax and a catch-up of the taxation of diesel compared to petrol. Thus, this ecotax is expected to generate 3.5 billion euros of revenue for 2018. The Finance Law also intends to roll out plans for the allocation of an income-based energy allowance to all French departments: with an annual amount of 150 euros on average, it will support 4 million households in the payment of their energy expenditure or support certain expenses related to the energy renovation of their homes. Conclusion: how can we (re)act to advance the social-ecological State? If the government does not take the path of reducing inequalities, the role of civil society becomes more important. For example, the private sector has understood the importance of nudges to transform practices. According to this concept of behavioural science, indirect suggestions can, without forcing, influence the motivations, incentives, and decision-making of individuals, as effectively or even more effectively than legislation. This type of tool could therefore be adapted and used to encourage households to modify their behaviour to reduce fuel poverty and generate additional income. Many initiatives aimed at reducing social and environmental inequalities are also developing at the local level, supported by solidarity movements. For example, the urban commons movement, which fights for commons (green spaces, cultural areas, etc.) by challenging land grabbing, and encouraging all to participate in the life of the community, aims to encourage sustainable and more integrative urban development. For Lucas Chancel, it is important that this local energy should be added to the conventional toolbox of the welfare state. Civil society must therefore contribute to the dissemination of these tools and advocate for their recognition at the national level. However, civil society must not abandon the international framework. 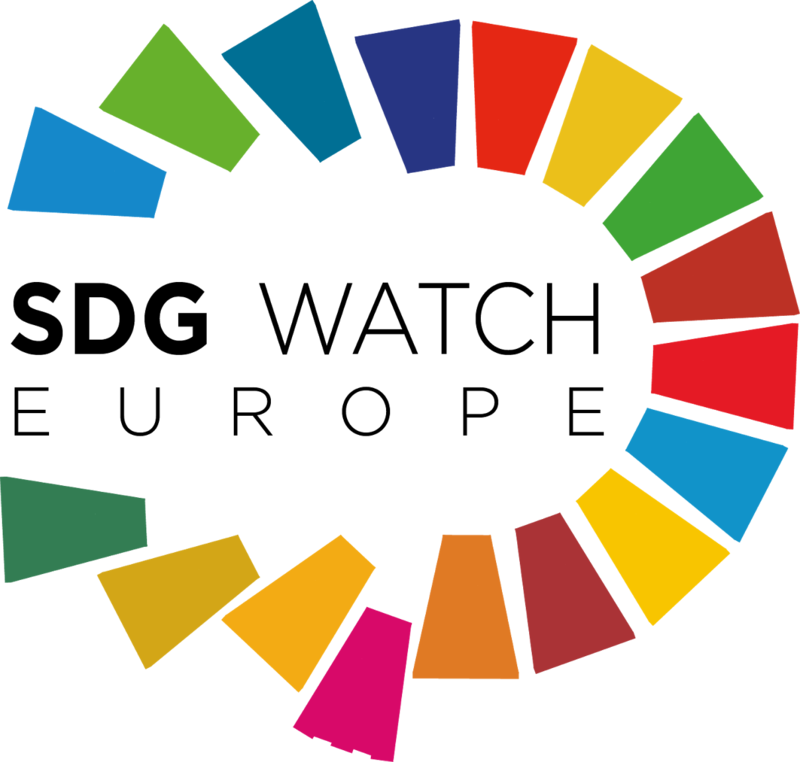 In particular, it must rapidly seize the Sustainable Development Goals (SDGs), adopted by 193 heads of state at the UN in September 2015. These goals, applicable to all countries, provide a governance framework to promote the social-ecological state. “The SDGs give hope in that they set a course and can shift boundaries,” according to Lucas Chancel. Over a period of fifteen years, this means reducing inequalities, giving everyone access to social protection, good quality education, reducing gender inequalities, etc. “But there are many conditions for the SDGs to truly help the ecological and social transition, and they are far from being met,” qualified the author. One of these conditions is related to the monitoring and reporting on the SDGs. To measure the progress made in the implementation of these objectives, “States have adopted a full set of indicators taking into account in particular the reduction of inequalities and environmental protection”, underlined Lucas Chancel. Civil society must advocate for improved access to data to carry out this monitoring, and to enable citizens and organized civil society actors to contribute to these databases. Transparency and co-construction of databases should enable civil society to rank good and bad performers in terms of reducing social and environmental inequalities. This ranking would provide them with an interesting advocacy tool to hold governments accountable for reducing inequalities. – Facundo Alvaredo et al. (coord.) (2018). World Inequality Report 2018. Executive summary. World Inequality Lab (WID-World). – Lucas Chancel (2017). Insoutenables inégalités. Pour une justice sociale et environnementale, Les Petits Matins. – Lucas Chancel (2017). Unsustainable inequalities? IDDRI Blog. Available online here. – Lucas Chancel and Tancrède Voituriez (2015). Prendre au sérieux la réduction des inégalités de revenus : un test décisif pour les Objectifs de développement durable, Issue brief 06/15, IDDRI. – David Card, Alexandre Mas, Enrico Moretti and Emmanuel Saez (2012). “Inequality at work: The effect of peer salaries on job satisfaction”, The American Economic Review n°102, vol. 6. – Alain Cohn, Ernst Fehr, Benedikt Herrmann et al. (2011). Social comparison in the workplace: evidence from a field experiment, Discussion Paper n° 5550, IZA. – Eric Heyer, Pierre Madec, Mathieu Plane, and Xavier Timbeau (2017). Evaluation du programme présidentiel pour le quinquennat 2017-2022, Policy brief 25, OFCE Sciences Po Paris. – Pierre Madec, Mathieu Plane, and Raul Sampognaro (2017). Budget 2018: pas d’austérité mais des inégalités, Policy brief 30, OFCE Sciences Po Paris. – Oxfam (2018). Partager la richesse avec celles et ceux qui la créent, Oxfam International. – Richard Wilkinson and Kate Pickett (2013). Pourquoi l’égalité est meilleure pour tous, Les Petits Matins. – Gabriel Zucman (2017). “La ‘flat tax’ est une bombe à retardement pour les finances publiques”, Le Monde. Since 2015, Lucas Chancel has been co-director of the World Inequality Laboratory at the Paris School of Economics, and lecturer at SciencesPo Paris specializing on the economics of inequalities and sustainable development. He is also a senior researcher at IDDRI. Previously, he worked as a consultant for TERI (Energy and Resources Institute, New Delhi, India) and for EIFER (European Institute for Energy Research, Karlsruhe, Germany). He has also been a visiting scholar for the United Nations Habitat Program. His current research focuses on the interactions between social, economic and environmental inequalities. He has also worked on new indicators of prosperity, the determinants of household energy consumption, and the links between prosperity, growth and environmental policies. A graduate of Sciences Po, Ecole Polytechnique and ENSAE (Master in Economics and Public Policy) and Imperial College London (Master in Renewable Energy Engineering), he also holds a double degree in physics and social sciences from Sciences Po and the University Paris VI. For more information on the reasons for the increase in global inequality, as well as the reasons for large regional disparities, see the summary of the 2018 World Inequality Report here. For more information on this movement, click here. Based on the model of the OECD PISA survey, which assesses the quality, equity, and efficiency of school systems around the world.